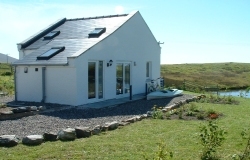 The Boat-House is a beautiful separate property within the private grounds at Redburn Houses. It boasts stunning features such as a newly fitted kitchen, bathroom, lounge, a mezzanine level double bedroom, and modern fixtures and fittings including dishwasher and washer drier, with a wonderful sheltered patio. It overlooks the private freshwater Loch Meadhonach, which can be seen in the pictures above. The Boat-House provides perfect accommodation for smaller groups seeking the independence of a self-catering holiday. The Boat-House has a double and single bed in the galleried bedroom, and a double sofa bed in the lounge area. There is a feature gas coal fire, a radio/cd player, a television and video player, tapes games and pastimes available for guests. A full list of available equipment can be obtained on request.